Established in 1975, the Triangle Universities Center for Advanced Studies Inc. (TUCASI) is the home of the three Founding Universities (Duke University, NC State University, and UNC-Chapel Hill) within the Research Triangle Park. 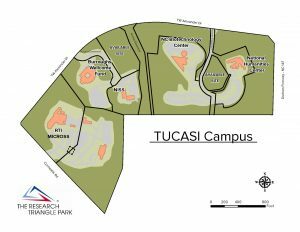 Set on a 120-acre campus, TUCASI houses organizations that bring together faculty from the three universities with Park scientists and researchers. Think of it like a park within the Park! MCNC is an independent, non-profit organization that employs advanced networking technologies and systems to help Community Anchor Institutions in North Carolina communicate with their constituents more effectively and meet their specific organization’s mission, vision and goals. For more than a quarter century MCNC has operated a robust, secure, exclusive communications network that has connected institutions of the University of North Carolina System, Duke University, and Wake Forest University to each other and to the world. With a 35 year+ heritage, Micross Components began transforming specialty electronics by creating a global company with the broadest offering of products and services in the industry and quickly became recognized as the global leading single-source supplier of specialty components designed and manufactured to the highest quality standards. And today, Micross continues to serve the Aerospace, Defense, Space, Medical, Industrial markets with the most comprehensive range of hi-reliability and custom solutions available from one source. The National Humanities Center is the leading independent American institute for advanced study in all fields of the humanities that seeks to ensure the continuing strength of the liberal arts and to affirm the importance of the humanities in American life. The NC Biotechnology Center makes the connections that create biotech jobs for North Carolina. Established in 1984, the NC Biotechnology Center is a private, non-profit corporation supported by the General Assembly. Various programs and statewide offices create long-term economic and societal benefits for North Carolina through support of biotechnology research, business and education and strategic policy statewide.